This is part of a series of recipes that I'm going to call the "Miami" recipes because they all come from the Miami Daily News. 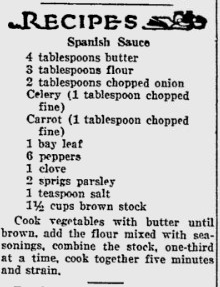 I was searching Google Archives for some new recipes and I happened upon the 1920's editions of the Miami News. In addition to tons of great ads that make me sad for the effect of inflation on our wealth, they posted a daily recipe on the family section. Most of these recipes are hardly noteworthy, or else I have them already in my other cookbooks, but some, a worthy few caught my eye and this was one of them. Technically speaking, this is a home cook version of the French Sauce Espanogle which is a terror to make in the original French method. 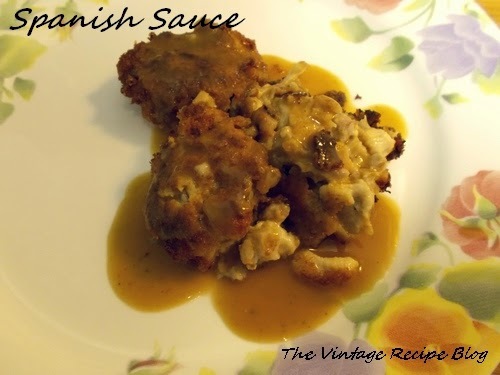 This sauce however is quite easy to whip up and tastes so much better than just your plain brown gravy. I've used it on chicken and pork and suspect it would go rather well with a good roast beef. The ingredients are nothing out of the ordinary and I'd have to say this sauce has become a standard with my repertoire. Mince all your vegetables and set aside. In a small bowl combine flour, clove, salt and peppercorns. Melt butter in saucepan over med-high heat and add vegetables, parsley and bay leaf. Lower heat to med and saute about 10 mins until vegetables are quite soft. Add in flour mixture, cook and stir until flour is cooked, about 5 mins. Pour in beef stock and stir until sauce thickens. Lower heat to low and let simmer, stirring occasionally, until needed, do not allow it to boil. To serve, strain through sieve and press the solids with the back of a spoon to get all liquid. Take to table immediately. No they don't. Whomever said food in the old days was bland never tried any of these recipes!